Front page of the Richmond Times-Dispatch! Richmond Times-Dispatch, Metro Business section, Biz Buzz by Louis Llovio, “Book Release” announcement, September 19, 2011. NBC 12, “Thalhimer Family Reunites, Sells New Book,” by Iva Petrosino, October 14, 2010. In Finding Thalhimers, Elizabeth Smartt has made her mark as a fine storyteller. She has done so with a fresh and intriguing voice, clearly a triumph for a first-time author. Smartt will pull you head over heels into an ever-expanding family saga from the first page to the last. You’ll laugh. You’ll cry. You’ll identify with the family characters as your own. And, if you’ve lived anywhere near, in or around Richmond, you’ll remember when…. Don’t take this book to bed with you, unless you plan on staying up all night. The personal stories of Elizabeth’s quest give the story a vital thread that draws the reader through her quest to uncover her family’s original ancestry…It’s a fascinating read that not only reveals a huge part of Richmond’s history, but tells the story of what’s happening to many family-owned businesses in the era of big box chains and Wal-Marts. What could have been a straightforward telling of names and dates is made more accessible (and entertaining) by Elizabeth’s choice to include a warm and sometimes heartbreakingly honest account of her own experiences uncovering her family’s history…The past gives context to the present, the present shows the importance of the past, and you’re left feeling there’s no way the book could have given you one without the other — it just wouldn’t be the complete Thalhimer story. Finding Thalhimers is a compelling blend of memoir, history, and genealogical treasure hunt. One must admire Elizabeth Thalhimer Smartt’s meticulous devotion to revealing her family’s legacy, in full. The Thalhimers lived through and helped shape momentous chapters in American life. But the author’s quest to understand these roots and how they might serve as a guide for her own young family is a story in itself. It is heartfelt, at times deeply funny, and in the end, a testament to the enduring power of memory. 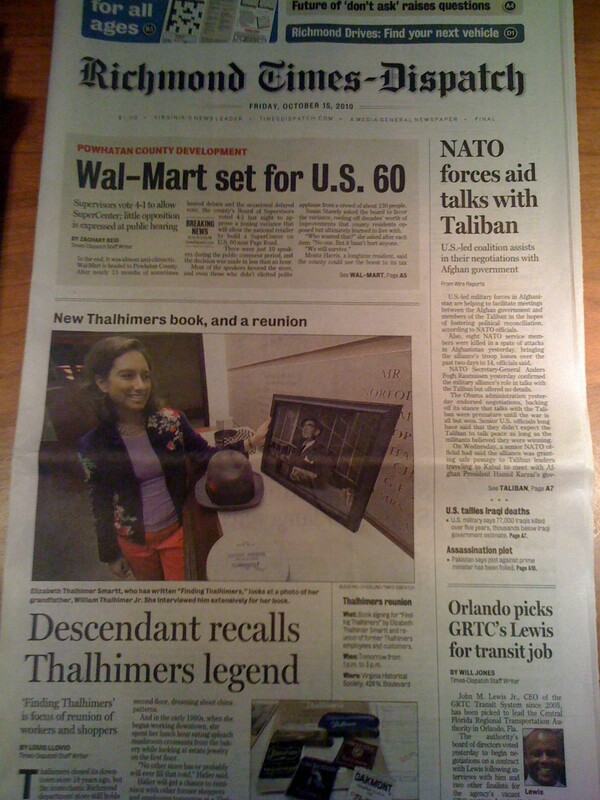 As one who grew up in Virginia, I am all too easily swept away just by the name Thalhimer and the memories it evokes. Finding Thalhimers is a complex book, chronicling the rise and fall of a great department store while tracing the lives and times of the Thalhimer family, from Germany to the American South, through Elizabeth Smartt’s in-depth research. A rich and evocative read. It’s no secret that Richmonders, and thousands of yearly visitors, have a particular fondness for heritage and tradition. History lovers come to tour battlegrounds and other attractions of bygone eras — and Richmonders are known for their dedication to hometown merchants. Smartt keeps the writing simple, but sharp, with some humor sprinkled in for good measure. Finding Thalhimers provides a mostly positive but ultimately satisfying chronicle of one of the city’s most admired and cherished retail institutions.